Ah the siblings of newborns! Let’s be honest, getting siblings of newborns in the frame is a top priority for parents. Who doesn’t love the tiny newborn cozied up in the arms of their older sibling? I know as a momma, this was the ONE thing that I wanted out of my newborn session when my youngest was a baby. But here’s the thing, most siblings of newborns are toddlers. And we all know that toddlers can be a force to contend with, especially when you want them to sit still and smile. It can be a diabolical situation for sure, add the pressure of the day, and boom! Things can go south in a hurry. Trust me, I have been there! But there’s good news! It doesn’t have to be that way! Let’s break it down into simple steps. Toddlers do not have much control in their lives. And let’s face it, they just had a newborn pop into their life and turn it upside down. And yet, we expect them to come into a strange studio, lay down on a fuzzy rug, hold still, and smile. Good grief! Does it sound overwhelming? This is why we must prepare them on what is going on and what to expect. In a fun way! 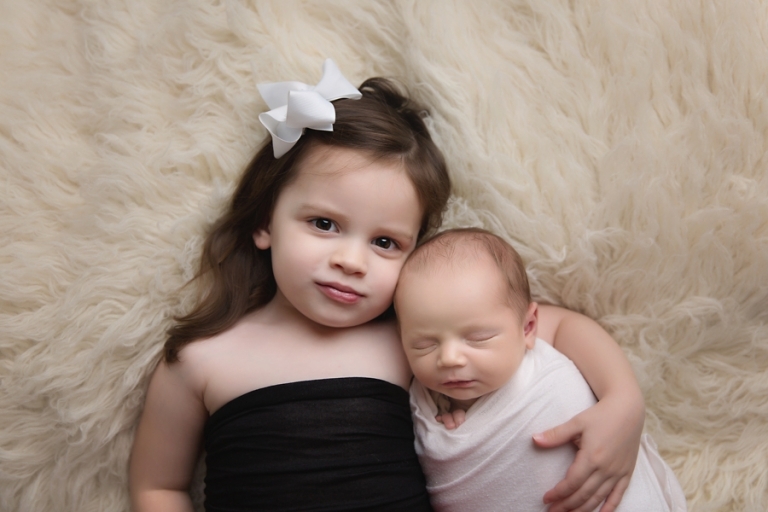 A few days before, tell them that you are going to have your photos taken soon with their new baby brother or sister. Show them a spot on the wall where you would like to hang their photo and tell them about the studio. You can find photos of my studio here and most photographers have them on their website. It is also helpful to show them a few photos so they can see a fuzzy rug or whatever else your newborn photographer uses often in these photos. Also, tell them that the studio will most likely be hot. Bribing is a common way that parents try to coerce their toddler’s behavior, but let me tell you, it almost always backfires! We live in an instant gratification society (thank you Amazon!) so of course if we mention ice cream, they want that ice cream NOW. Make sure when talking to them about the upcoming newborn photography session that you keep your tone positive! Tell them your photographers name and that they have little kids (if applicable). If close to Christmas, get them even more excited by telling them you can’t wait to show Santa what a good big brother or sister they have become. By the time they arrive, they almost always warm up and listen well. I like to show them how my light works and the noise maker that always gets their attention. It also helps if parents allow me or your photographer some space to interact with them to build trust. Once they have done what is asked of them, feel free to break out the candy or whatever else is a special treat! One important side note, don’t ask them to say cheese unless you prefer a contorted smile versus a genuine one. If you are a big cheese family, step back and allow me to interact instead of asking them to say cheese. The best smiles are the most genuine, even if there’s some potty humor involved! Pretty simple and easy right? Thank you so much for stopping by the blog! Are you looking for a newborn photographer Wooster Ohio? Please contact me today!